Well before the age of amplification by sophisticated means such as vacuum tubes, François Dussaud (1870 - 1953) was experimenting with electrical playback of cylinders. His idea was to help the deaf to train their hearing, much in the same way as Augustus Rosenberg in his later work. The technology at hand was the carbon microphone, already widely used in telephones. With this, Dussaud actually managed to produce an amplification. A carbon microphone is really a variable resistor, that changes its resistance with the vibration of the thin membrane constituting one of its sides. A direct current is passed through the microphone (B in the image above), which modulates it, just like what is happening in a vacuum tube, or in our days, a transistor. So in fact the electric current was driven by the batteries in the circuit. 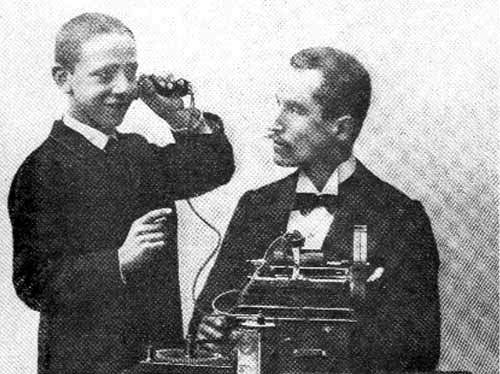 Dussaud even incorporated a volume control in his machine. In the image above we see the version he presented to the Académie de Médicine in Paris in 1896. In front of and below the phonograph the image shows a battery (C). The big round device on top of the battery is a rheostat, with which a varying number of individual battery cells could be included into the circuit, feeding a higher or lower voltage into the circuit, and thereby changing the sound volume in the earphone (D). A deaf boy practising with Dussaud and his phonograph. 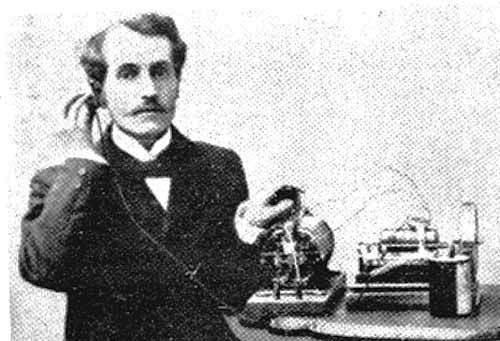 François Dussaud with an 1894 electric phonograph.